- Views over Collingwood Beach from balcony and kitchen. The swimming pool is fully fenced and at front of the house, separate to the flat grassed area at the rear of the house. Great for kids cricket, soccer and games. Golf, Beach, Surf, Relax. Walking distance to Restaurants, Cafe's, Pub, Cinema, Shops. Dolphin & Whale watch from the balcony. Moona Moona Lookout is a 'dog-friendly' property with a off-leash beach within 5 mins walk. Moona Moona Lookout is only for holiday accommodation and not for private use. A grade service. Discount for late bookings or less than four People. Lease Agreements must be signed & returned before checking in. $ minimum of $500 bond must be paid (or credit card authorisation) prior to checking in. Late checkout can be made with prior arrangement. It may incur an extra cost. Moona Moona Lookout only takes minimum 7 night bookings in December & January unless not booked closer to that time. Bookings for groups up to 21 people can be arranged if both properties are available. 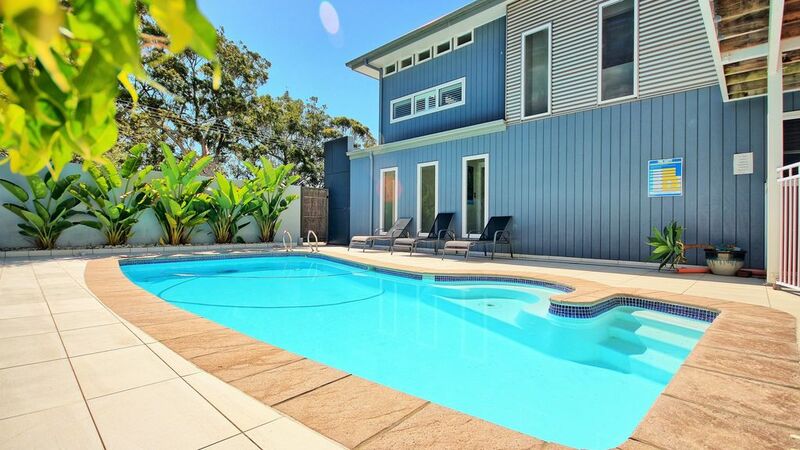 The 4 bedroom 3 bathroom house (sleeps 8) on Elizabeth Dr may suit your group, if Moona Moona Lookout is too small or too big. Completely refurbished (painted, new floorboards, new decking, new furniture etc). Lovely home right next to the beach! Airy sunlit home.. very clean.. had a great weekend with the children! Perfect location with views of the ocean. My brother, two sisters, mother and our families stayed at Moona Moona lookout for the weekend. The house was wonderful and plenty big enough for all of us. Our dogs also had a wonderful time and the baby gate at the top of the stairs was very welcome! We can highly recommend the house for families and groups. Comfy beds, nice bathrooms and an excellent shower. Kitchen was well equipped, plenty of parking and beds & baths for our group of 8. Bbq, foxtel for the games that were on over the wknd and wifi was a plus, especially for the kids. Hope to have you and your family back in the future. What a beautiful home and walking distance to the beach! The pool was so refreshing to jump into after a beach swim as well. Would definitely come back / recommend to friends.